Here we display for comparison four sets of photos taken by Shunkichi Kikuchi. These photographs were taken of the same scenes from nearly the same locations when he visited Hiroshima in October 1945 and August 1947. His photos of busy streets, houses being built in the burnt ruins, and children playing are indisputable evidence that people who had lost their health, families, workplaces, and dreams nevertheless arose from the depths of despair and exerted the tremendous effort required to go on living day after day. 1-2/Kamiya-cho intersection (Distance from hypocenter: approx. 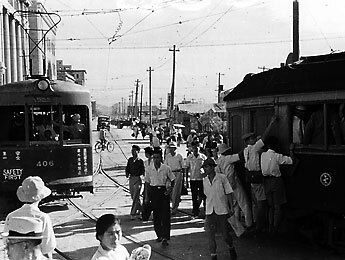 260m) Streetcar system's Ujina Line. Two years later, the number of operable cars had increased to about forty. But that was not enough to handle the rapidly recovering passenger load, as cars were always overcrowded. Accidents occurred often, as many passengers hung on from the outside, jumped on, and jumped off the cars. 3-4/Hiroshima Electric Railway Company (Distance from hypocenter: approx. 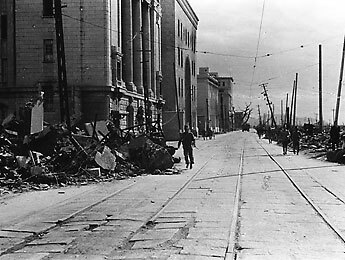 2km) The Hiroshima Electric Railway Company's office building was partially destroyed but escaped the spreading fire. 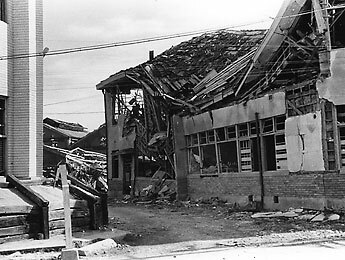 The roof and walls collapsed, the windows and doors were blown out, and many people were killed or injured. Restoration was completed in September, two years after the bombing. 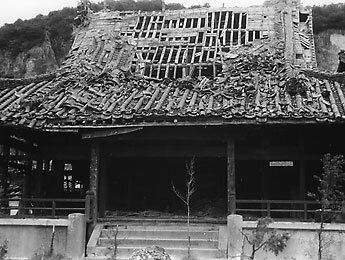 5-6/Hypocenter: Shima Hospital The atomic bomb exploded approximately 600 meters in the sky overhead. 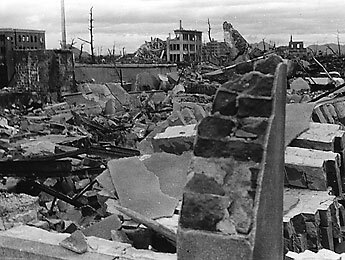 Directly below, at the hypocenter, stood Shima Hospital, whose nearly one-meter-thick brick walls instantaneously collapsed. 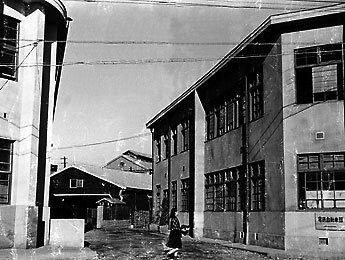 Photograph taken toward the south from the street in front of Shima Hospital. 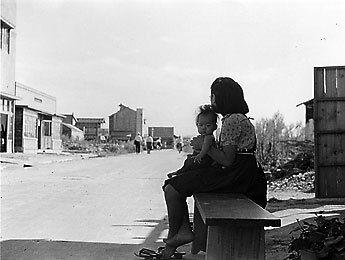 The hypocenter is in the empty lot on the left side of the street where weeds are growing, in the direction being look at by the woman with the child at her knees. 7-8/Onaga Temple (Distance from hypocenter: approx. 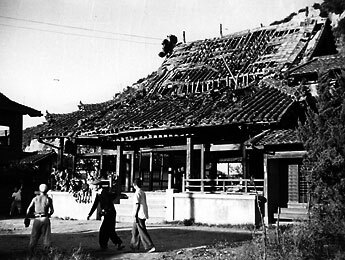 3.4km) The roof of the Onaga Temple had damaged tiles, and its frame became exposed. Two years later, the roof had still not been repaired, but the interior of the main hall had been restored and young people could be seen playing baseball on the grounds.